Therefore, thus says the Lord, the God of Israel, concerning the shepherds who shepherd my people: It is you who have scattered my flock, and have driven them away, and you have not attended to them. So I will attend to you for your evil doings, says the Lord. I myself will gather the remnant of my flock… 4I will raise up shepherds over them who will shepherd them, and they shall not fear any longer, or be dismayed… says the Lord. This is surely something that many of us need to hear and remember in our distress over the present rule and governance of this nation. A republican political commentator whom I heard yesterday said, “It sometimes seems hard for me to credit, but it is less than two years since we had a president with whose policies I often disagreed, but who never gave me the slightest reason to question his fitness to lead us. We can have such leaders again.” The republican commentator was right. Let us be candid. This nation has in its short history committed graver sins than it is committing at present, and got itself into worse messes than the mess it is in now. Let us not forget the long history of slavery, longer in this country than in any other western nation, nor the ethnic cleansing of the Native American population (dear God, we of all people should not forget that, for the Trail of Tears passes through our domain! ), nor that dreadful Civil War in which 620,000 Americans killed each other. So much for our reading from the Old Testament! Let’s turn now to the passage appointed for our epistle, which comes from the middle of St Paul’s Letter to the Ephesians (and yes, that’s right: despite current critical fashion, it remains in my view far more likely that St Paul was the author of Ephesians than that he wasn’t[iii]). But never mind all that! Let us turn to the text itself. And that is exactly the point that Paul makes in the opening part of his Letter to the Ephesians, which begins with a glorious vision of the whole created universe in God and in Christ, of ourselves and all things in the midst of what Père Teilhard de Chardin taught us to call le milieu divin—“the divine milieu”— a cosmos in which we find ourselves moving in often bewildering succession through chaos and order, grief and joy, hope and fear, life and death, but always, we believe, toward a goal, a destiny, a fulfilment, which is “to sum up all things”—and Paul very clearly, here as elsewhere, does not say “all Christians” or “all believers” or even “all people”, but quite unambiguously, “all things: τὰ πάντα”—“to sum up all things in Christ, the things in heaven and on earth” (1:10). Thus the apostle has his eyes fixed on the heavens, the cosmos, the universe, and every creature in it, every man, every woman, every beast, every leaf and blade of grass, all—destined for glory! that you were at that time separate from [God’s] Messiah, aliens from the commonwealth of Israel, and strangers to the covenants of promise, having no hope and without God in the world. There is surely no barrier we can think of, no division we know about, deeper or more profound than that which, for a Shammaite Pharisee, existed at that time between a member of God’s people and a gentile. 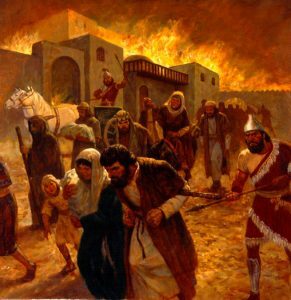 Let us be clear: that passionate adherence to the Law and circumcision which was so much more a mark of God’s people after the exile than it was before—that is, after they were scattered among the nations, after a situation had arisen in which they might so easily have lost their identity as they could never have done while they were still a sovereign people in their own land—that very passionate adherence to the Law was in some respects precisely so that they might retain their separateness, their distinction as a holy people, a people chosen by God for God’s own possession. But now in Christ Jesus you who once were far off have been brought near by the blood of Christ. For he is our peace. In his flesh he has made both groups into one and has broken down the dividing wall of partition, that is, the hostility between us. “Good fences make good neighbours” we say, and think we are being wise. But if so, it is the wisdom of the world. Oh, perhaps there is a little genuine wisdom in it, while we are still strangers, learning to know one another. But made into an absolute, it is merely one more example of what G. K. Chesterton described as “all the easy speeches that comfort cruel men”[iv]: a convenient excuse to ignore the other, to exclude the other, and then if we will to persecute and oppress the other, on no other ground than that the other is different from us. Almost the first thing that God says about humanity is that “it is not good for a human being to be alone” (Gen. 2:18). God creates us for fellowship, the divine possibility of union in distinction, the very thing that God’s own Self enjoys in God’s infinite triune perfection. What follows? I think we may safely say that it follows that in the long run God does not like walls, at least not when they are intended to divide. to proclaim, “’Shalom aleichem’, “Peace to you” who were far off, and ‘Shalom’ to those who were near; for through him we both have access in one Spirit to the Father. That is the truth of the gospel, available for all who will have it. “Through Christ we all have access in one Spirit to the Father.” As Wesley said, “’Tis mercy all, immense and free, for O my God, it found out me.” And it is with “the eyes of our hearts enlightened” (Eph. 1:18) by this truth that we are called to look at the world and ourselves. As many of you know, I am going to England at the end of the month and expect to be there for a year. Which means that I do not know when I shall next preach a Sunday sermon to you: perhaps never! Life is full of uncertainties, and I am not exactly young. Certainly when I am away from the United States what I shall miss most will be my dear friends in Sewanee. 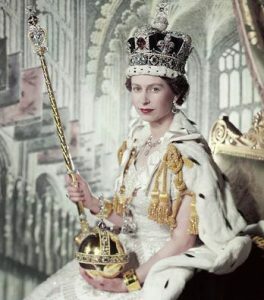 But still, as I have long had to remind myself apropos those who are dear to me in England, so at least for the coming year I must remind myself apropos you who are dear to me in America: as the orb of the coronation says, “the whole world is subject to the power and empire of Christ our redeemer”. Which means that whether we are near to each other as the world counts miles or far, still, through Christ we all of us, as Paul says, “have access in one Spirit to the Father.” That is a bond greater than any bond of geography, culture, political allegiance or nation, and it is a bond that no earthly power, and not even the power of death, can break. It is surely enough. 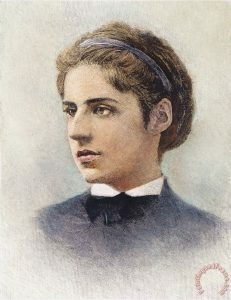 [i] The American poet Emma Lazarus wrote her sonnet, “The New Colossus” in 1883. She wrote it to sell at an auction to raise money to build the pedestal on which the Statue of Liberty was to be placed in New York Harbour. The statue itself was a gift from the people of France, but American contributors paid for the pedestal. Lines from the sonnet beginning with “Bring me your poor” were later chosen to be inscribed on a bronze plaque that was placed on the platform in 1903. The lines were set to music by Irving Berlin for the musical “Miss Liberty” (1949), based on the story of the sculpting of the statue. [iii] As I have pointed out elsewhere, none of the arguments against Pauline authorship is watertight or even particularly strong. Certainly they are not strong enough to merit the current general academic conviction of the existence of an otherwise unknown theological genius who created this magnificent letter (and possibly also Colossians), but left no other record of their existence. The matter was well stated by F. F. Bruce: “If the Epistle to the Ephesians was not written directly by Paul, but by one of his disciples in Paul’s name, then its author was the greatest Paulinist of all time—a disciple who assimilated his master’s thought more thoroughly than anyone else ever did. The man [or woman] who could write Ephesians must have been the apostle’s equal, if not his superior, in mental stature and spiritual insight. For Ephesians is a distinctive work with its own unity of theme… It was no mean judge of literary excellence, Samuel Taylor Coleridge, who described Ephesians as ‘the divinest composition of man’ (Table Talk). Not only is it the quintessence of Paulinism, it carries Paul’s teaching forward to a more advanced stage of revelation and application than that represented by the earlier epistles. The author, if he was not Paul himself, has carried the apostle’s thinking to its logical conclusion, beyond the point where the apostle stopped, and has placed the coping-stone on the massive structure of Paul’s teaching. Of such a second Paul early Christian history has no knowledge.” (The Epistle to the Ephesians [London: Pickering and Inglis, 1961] 11-12). Precisely. [iv] G. K. Chesterton, “Oh God of earth and altar” (in The English Hymnal [London: Oxford University Press, 1906]). For the text online see https://hymnary.org/text/o_god_of_earth_and_altar.